In the vast northern reaches of Alberta, home to the Cree, Chipewyan Dene, Dunne-za and Métis peoples, one of the last remaining stretches of coniferous boreal forest has become a center of international attention. But despite a long history of logging in the region, the conflict isn’t over timber: energy companies and investors are instead looking at what lies beneath the ground. Alberta’s vast oil sands — a mixture of sand, water and a semisolid form of petroleum called bitumen — account for 97 percent of Canada’s proven crude oil reserves, making Canada the largest source of foreign oil for the world’s largest energy consumer, the United States. However, many in the region’s indigenous community, along with environmental conservationists, see the oil production as a shortsighted economic solution that is bringing environmental disaster. “Our leaders are selling out for money,” said Rose Desjarlais, a Dene elder. “What will money do when our forests and waters are gone? It has to stop, but we need help.” Meanwhile, a proposed 1,700-mile oil pipeline that would connect the oil sands fields with refineries on the Gulf Coast of Texas spreads the environmental concerns beyond Alberta’s borders and has ignited controversy in Canada and the United States. Northern Alberta’s oil sands, the world’s largest deposit, lie under boreal forests and wetlands, a diverse ecosystem that stores twice as much carbon as a tropical rain forest. Combined, the region’s three major deposits — Athabasca, Peace River and Cold Lake — cover 54,000 square miles, an area roughly the size of Florida. The region is the traditional home of the Mikisew Cree, Chipewyan Dene, Dunne-za (Beaver) peoples, along with the Métis, who are descended from unions between Europeans and First Nations peoples. The oil sands, also known as tar sands because the thick oil resembles roofing tar, provided the region’s original inhabitants with a useful product for waterproofing their canoes. The area’s most important natural resources, however, were its water and the animals that lived in its lush forests and rivers. These indigenous people traditionally lived in small bands, subsisting through hunting, fishing and trapping, and the diversity of wildlife — caribou, buffalo, moose, beaver, ducks, geese and fish — made for a rich diet and cultural life. The people recognized individual animals in their prayers, but knew that at the base of all life was water. Today, the Aboriginal peoples of the region maintain a close relationship with the natural world, continuing their ancestors’ hunting and fishing traditions and ties to the water and the land. There are sacred sites, including burial grounds and ceremonial lands, throughout the landscape, but details and locations are closely guarded by the communities that revere them. The first Europeans arrived in 1788, and over the next century, population and industry increased with a booming fur trade and the exploration of gold reserves. From 1871 to 1921, the Aboriginal peoples of Canada signed a series of numbered treaties with the reigning monarch of Canada. The treaties ceded aboriginal rights and titles to their traditional lands in exchange for smaller parcels of land and certain rights such as the right to continue to hunt, trap and fish on the area surrendered, subject to regulation. Decimated by the arrival of the Europeans, the First Nations peoples agreed to the treaties, causing some historians to term the treaties “submit or starve” policies. In 1899, England’s Queen Victoria signed Treaty Number 8 (“Treaty 8″) with the Cree, Dene and Dunne-za in which “said Indians do hereby cede, release, surrender and yield up to the Government of the Dominion of Canada … all their rights, titles and privileges whatsoever” over a vast territory that included northern Alberta, thus clearing the way for natural resource exploitation. The completion of a railway in 1922 opened the region to logging, and in the 1960s, highway construction heralded the next transformation of the boreal landscape: the oil boom. Energy companies began separating oil from the sands in the 1930s, but extraction was difficult and production minimal. Commercial production began in earnest in 1967 with the opening of the Great Canadian Oil Sands (now Suncor Energy) surface mine, and 11 years later Syncrude began operating what is now the world’s largest mine. During the last decade, Shell Canada and Canadian Natural Resources Ltd. opened new mines, and Suncor and Syncrude expanded their operations; several more mines are slated to open. Surface mining currently accounts for 53 percent of crude bitumen production. In the years since commercial production began, energy companies have focused on developing more efficient techniques for turning oil sands into crude oil. Only about 20 percent of Alberta’s bitumen reserves are recoverable by surface mining, which uses huge excavators to scrape away the surface layer, dig up the oil sand and transport it to extraction plants to separate the oil. However, with the development of new in-situ production techniques — which extract the oil on site and enable a far deeper reach than surface mining — the remaining 80 percent of bitumen deposits are potentially exploitable. There are at least 20 in-situ projects in operation, accounting for 47 percent of crude production. Thanks to improved processes, Alberta’s oil sands hold an estimated 175 billion barrels of recoverable oil, placing Canada’s proven crude reserves third globally, after Saudi Arabia and Venezuela. According to the Alberta Department of Energy, in 2010 Alberta’s oil sands bitumen production averaged 1.6 million barrels a day — the majority exported to the United States — and current forecasts indicate that production will increase to 3.2 million barrels a day by 2019. Alberta’s oil sands facilities reportedly form the single largest industrial zone in the world today. Criticism of the oil sands industry focuses on the high water and energy usage required for processing, forest destruction, huge tailings waste ponds associated with surface mining and greenhouse gas emissions. Despite improvements in efficiency, oil sands extraction remains a highly resource-intensive process. Current in-situ extraction processes use natural gas-fired boilers to generate steam, which is injected into wells drilled into seams of bitumen deposit, thus softening the bitumen and allowing it to be pumped to the surface. In-situ processes require 0.6 to 0.9 barrels of water to extract and upgrade one barrel of bitumen, according to a report by the sustainable-energy think tank Pembina Institute, while surface mining, which uses hot water to separate oil from sand once the bitumen has been mined, requires 12 barrels on average. Industry estimates run lower: half a barrel for in-situ extraction, and two to four barrels for surface mining. While 70 to 90 percent of the water is reused, the remainder still amounts to a significant quantity of water — raising concerns about drawdown of the major rivers that flow through the region. Pembina Institute reports that mining operations are licensed to divert a quantity of fresh water from the Athabasca River roughly equivalent to the annual needs of a city of three million people. The liquid waste produced from mining operations is stored in enormous tailings lakes, creating yet another concern. These lakes, which cover an area of more than 65 square miles, are leaking 3 million gallons of toxic water per day. The lakes contain toxic substances including naphthenic acids which are acutely toxic to aquatic organisms and mammals. A 2004 report by the National Energy Board of Canada found that “the principal environmental threats from tailings ponds are the migration of pollutants through the groundwater system and the risk of leaks to the surrounding soil and surface water.” A 2013 report concluded that an accident related to the failure of one of the oil sands tailings ponds could have catastrophic impact on the aquatic ecosystem of the Mackenzie River Basin due to the size of these toxic lakes and their proximity to the Athabasca River. Meanwhile, the boreal region is shrinking and along with it, the habitat of animals who live there. Since oil sands mining operations began, 256 square miles of land has been disturbed. While this represents an area less than the size of the city of Edmonton, environmental groups have noted that once in-situ operations are factored in, the area for potential disturbance increases dramatically. Some 30,000 square miles of land — the majority of which is boreal forest — have already been leased to in-situ companies for development. Pembina Institute reports that woodland caribou populations around current oil operations dropped 50 percent from 1996 to 2006, and area First Nations people describe dramatic decreases in caribou, ducks, frogs and other wildlife. Climate pollution from producing tar sands oil is projected to hit 104 metric tons of carbon dioxide by 2020. That is twice current emissions from Norway – and exceeds the combined emissions from 85 nations. The oil sands operations are the fastest growing source of heat-trapping greenhouse gas in Canada. By 2020 the oil sands will release twice the amount produced currently by all of the cars and trucks in Canada. According to Canada’s 2007 Greenhouse Gas Inventory, the country’s emissions had risen 26 percent since 1990 and were 33.8 percent higher than Canada’s Kyoto Protocol target. The “significant rise in emissions,” it said, was due in part to “large increases in oil and gas production.” Total life-cycle emissions from products derived wholly from oil sands are 5-15 percent higher than average crude oil. Area residents, primarily First Nations and Métis peoples, living downstream from oil sands activities report elevated cancer rates and other health problems. A 2007 study commissioned by the local health authority of Fort Chipewyan, on Lake Athabasca, found high levels of carcinogens and toxic substances in fish, water and sediment downstream from oil sands projects. Of greatest concern was the presence in sediments of a group of carcinogenic chemicals known as polycyclic aromatic hydrocarbons. Concentrations of the chemicals were found to have risen from 2001 to 2005, and in some cases were four times higher than U.S. recommended limits. High levels of the chemicals, along with mercury and arsenic, were found in fish, which account for a substantial part of the diet of many local residents. An Alberta Health Services study of cancer incidence in Fort Chipewyan from 1995 to 2006 found a higher-than-expected number of cancer cases overall: 51 instead of 39, out of a population of about 1,100. In particular, it noted an increased incidence of cases of biliary tract cancers, cancers in the blood and lymphatic system and cancers of unknown primary origin in the most recent six years (2001-2006) compared with the previous six years. For the industry’s part, representatives point out that oil sands are strictly monitored, and meet or exceed regulations, that the industry provides much-needed jobs for the region, as well as a much-needed energy source for consumers in North America and beyond, and that the bulk of greenhouse gases produced by oil sands petroleum come from burning it on the consumer’s end, not from the extraction and upgrade process. Representatives also say the industry continues to look for cleaner and safer ways to operate, including reducing the need for tailings ponds. Oil sands companies are engaged in mandated restoration of land that is no longer needed for mining purposes. 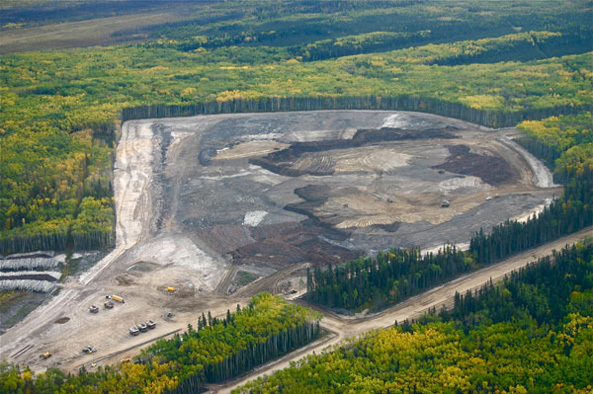 As of December 2012, about 77 square kilometers were under active reclamation, although only a fraction of that land has been certified as reclaimed by the Alberta government. The most controversial aspect of the oil sands industry is TransCanada’s proposed 1,700-mile pipeline, which would carry crude from the Athabasca region to refineries on the Texas Gulf Coast. The U.S. State Department, which has approval authority because the pipeline would cross an international border, released its final environmental impact statement on the project in August 2011. It found that the Keystone XL pipeline would have “no significant impact” on land and water resources along its route. Critics of the pipeline disagree, saying it could devastate ecosystems and pollute water sources, including the Ogallala Aquifer, a crucial U.S. water resource beneath the Great Plains. Spills are of particular concern, especially since an existing pipeline carrying oil sands crude—and owned by TransCanada—was shut down for repairs in May 2011 after springing two leaks in North Dakota and Kansas. Proponents of the pipeline point out the benefits of a stable supply of oil from a friendly neighbor in a time of rising fuel prices and Middle East instability. However, most of the oil that would travel to the Gulf Coast refineries is destined for export; in fact, six companies have already contracted for three-quarters of the oil, and five of them are foreign. In January 2012, President Obama rejected TransCanada’s permit for construction of the pipeline. Obama cited pressure from a congressionally-imposed deadline that he said did not give him enough time to assess the environmental impacts of the project. The president encouraged the company to reapply for a permit. In June of 2013, Obama said he would only grant approval of the Keystone XL pipeline if it “does not significantly exacerbate” climate change. In January 2014, the U.S. State Department released another final environmental impact statement which again found the pipeline would have no major impact on climate change. In response to Obama’s rejection of the original permit for the Keystone XL pipeline, TransCanada amended the route of the pipeline to minimize “disturbance of land, water resources and special areas.” The new route was approved by Nebraska’s governor in January 2013. However in February 2014, a Nebraska district court judge found the process that established the pipeline’s new route through the state to be unconstitutional. The pipeline case is currently awaiting review by the Nebraska Supreme Court. In April 2014, the U.S. State Department decided to hold off indefinitely on review of the pipeline permit, while awaiting the results of the ongoing litigation in Nebraska. The Pembina Institute’s Oil Sands Watch campaign is advocating a moratorium on new oil sands project approvals and lease sales until the government of Alberta implements policies and regulations that are “environmentally, socially and economically responsible,” and it has published a list of proposed solutions. There is also a push by Albertan First Nations to regain control over their lands, protect their sacred sites within the boreal forest, and develop sustainable management of their forests to provide alternative employment for the tribal members. Currently, these First Nations manage a designated forest management area, which paces their use of timber and ensures the preservation of their sacred sites. A sacred sites mapping project is also under way. For a more in-depth First Nations’ perspective, visit the Canadian Indigenous Tar Sands Campaign, which includes action alerts and ways you can help. Alberta Department of Energy. “Talk About Oil Sands.” April 2011. Alberta Department of Energy. “Talk About SAGD.” June 2010. Alberta Department of Energy. “Talk About Upgrading and Refining.” July 2011. Austen, Ian. “Study Finds Carcinogens in Water Near Alberta Oil Sands Projects.” New York Times, November 9, 2007. Canadian Association of Petroleum Producers. “National Geographic’s Article on Canada’s Oil Sands: An Incomplete Perspective.” CAPP, March 2009. Canadian Association of Petroleum Producers. Upstream Dialogue; The Facts on Oil Sands. June 2011. Canadian Centre for Energy Information. “Oilsands and Heavy Oil Overview.” Centre for Energy. Chen, Yiqun. Cancer Incidence in Fort Chipewyan, Alberta, 1995-2006. Alberta Health Services, February 2009. Dunbar, R.B. Existing and Proposed Canadian Commercial Oil Sands Projects. Strategy West Inc., August 2009. Dunbar, R.B. Canada’s Oil Sands—A World-Scale Hydrocarbon Resource. Strategy West Inc., February 2009. Grant, Jennifer, Simon Dyer and Dan Woynillowicz. Clearing the Air on Oil Sands Myths. Pembina Institute, 2009. Harkinson, Josh. “Scenes From the Tar Wars.” Mother Jones, May/June 2008. Kelly, Erin, et al. “Oil sands development contributes elements toxic at low concentrations to the Athabasca River and its tributaries.” Proceedings of the National Academy of Sciences 107, no. 37 (2010): 16178–16183. Lorinc, John. “Making Dirty Oil a Little Less So?” New York Times, Oct. 8, 2009. Lorinc, John. “Of Alberta’s Oil Sands and ‘Harmonizing’ Canadian and U.S. Climate Policy.” New York Times, Oct. 26, 2009. Norrell, Brenda. “Energy Genocide, Backlash Yield New Peoples’ Movement in the Americas.” Indian Country Today, July 24, 2006. Poitras, George. “Canada’s Bloody Oil.” Guardian News, August 24, 2009. “Say No to Keystone XL.” New York Times, October 2, 2011. “Treaty No. 8 Made June 21, 1899 and Adhesions, Reports, Etc.” Aboriginal Affairs and Northern Development Canada.